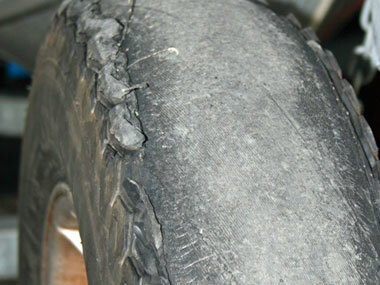 HOW OLD ARE the tyres on your RV? Don’t know? Well, it might be time to change them. Yes, I know they probably look brand new and have only done a few short sprints up the coast in the past half a dozen or so years, but looks can be deceptive. I learnt recently that tyres age, but they do it far more gracefully than you and I. While wrinkles and grey hair mean we can’t deny the passing years, a tyre can look like it has just come out of the factory, but may in fact be ready to fail in an instant. Of course, I gathered all this wisdom the hard way. We had done a couple of highway trips with our 5.65m trailerboat and, on two consecutive trips, a tyre had failed (peeled the tread clean off) in about the same spot on our journey. the second replacement in as many months, I asked why. “How old are your tyres?” was his immediate response. I thought for a moment and declared them to be 6 to 7 years old. “That’s your problem,” he said. 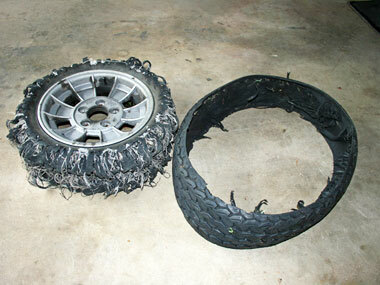 Tyres generally have a reliable life of about 5 to 6 years. “You can either change them all now, or change them one at a time, but eventually they will all fail,” the retailer continued, inducing a sharp pain in my hip pocket nerve. I bit the bullet and changed all five tyres, even though they looked almost brand new. (Few people actually wear out boat trailer tyres.) My decision was justified when the tyre fitter who was fitting the new tyres noticed a bubble in one of the old tyres. It was ready to shed its tread on our next fishing trip. While the above yarn might be about a boat trailer, there isn't a a lot of difference between that and the tyre on a caravan or camper trailer. In fact, I would say that good rubber is even more critical on an RV because they’re likely to do many more kilometres than a boat trailer. So, how old are the tyres on your RV? If you bought your rig secondhand, chances are you won’t have a clue. – the years slip by quicker than we realise. In hindsight, I was probably lucky with the two pre-loved vans we’ve owned. Both needed new rubber when we bought them and fitting new light truck tyres all round was a priority before we went anywhere. It proved to be money well spent when we completed a hassle-free, round-Australia trip with the first van without so much as a flat. Once you’ve got new tyres you’ll be keen to look after them, and many things can affect the longevity of this important piece of RV gear. Generally speaking, good quality tyres will last longer than cheapies, so buy the best you can afford. It’s also important to match your tyres to your RV, as well as the type of country you’ll be travelling in. Offroad work can demand specialised rubber. Most people will need the advice of their tyre retailer in this matter and don’t hesitate to get two or three opinions and quotes. Once you’re on the road, tyre pressures can be critical. Under-inflated tyres will create more drag and heat, which is a real tyre killer. Once again, be guided by your tyre retailer on the correct pressures for the load you’re carrying and adjust them to suit the terrain you’re traversing. You can also be kind to your tyres by reducing the weight you’re carrying as much as possible, so think twice about filling the water tank if it isn’t really necessary. Potholes and sharp edges can also be hard on tyres so try to safely avoid these rough spots. Incidentally, both tyres that failed on our boat trailer were on the passenger side and were probably subjected to rough edges on north Queensland roads, more than the other tyres. Between trips you should protect your RV’s tyres from direct sunlight by storing it undercover, or covering the tyres with a small tarp or a sheet of building materials. 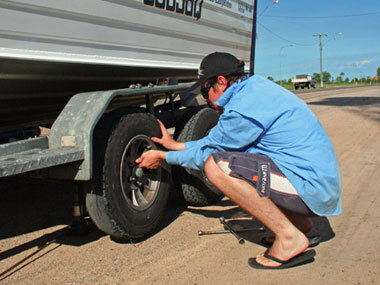 Another important tip is to jack the RV up to take the load off the tyres if you’re storing it for a long period. You can periodically check your tyres by running your hands over the walls and tread, feeling for bubbles which may signal separating internal layers. Also, look for cracks in the walls (often sun damage) although these may be just superficial. If in doubt, get the opinion of an expert. Look after your tyres and you should, according to my tyre retailer, get 5 to 6 years of hassle-free touring out of them. Beyond that may be a gamble – a risk that isn’t worth taking.